SYDNEY, AUSTRALIA – Australian smartphone sales are on track for a strong calendar year with booming first half sales set to continue into the second half of the year, according to a new study by emerging technology analyst firm Telsyte. New findings from the Telsyte Australian Smartphone & Wearable Devices Market Study 2017-2021 shows 4.4 million smartphones were sold during 1H 2017, up 16 per cent compared to H1 2016. “The arrival of at least three new iPhones, as well as the long-held strategy of keeping older models available at lower prices, will help Apple target its loyal customer base” Telsyte Managing Director Foad Fadaghi says. Telsyte estimates around 4.7m smartphones will be sold in 2H 2017, a result that could see Apple beat 2014 sales when it first released the larger format iPhone 6. Telsyte research finds that 1 in 3 Australian smartphone users have tried “AR-like” features on their smartphones which includes the popular mobile game Pokémon Go as well as Snapchat and Facebook photo filters. Telsyte believes these two categories (games and social) will be the most popular initially for AR, with navigation, education, shopping/retail and communications all likely to get early interest from app developers. “The release of Apple’s ARKit and Google’s ARCore is expected to support more advanced AR applications, driving awareness and usage which could rapidly expand in 2018” Telsyte senior analyst Alvin Lee says. Telsyte estimates more than half of iPhones in Australia are current capable of supporting Apple’s current ARKit, compared to less than 10 per cent of Android smartphones for recently announced Google’s ARCore. 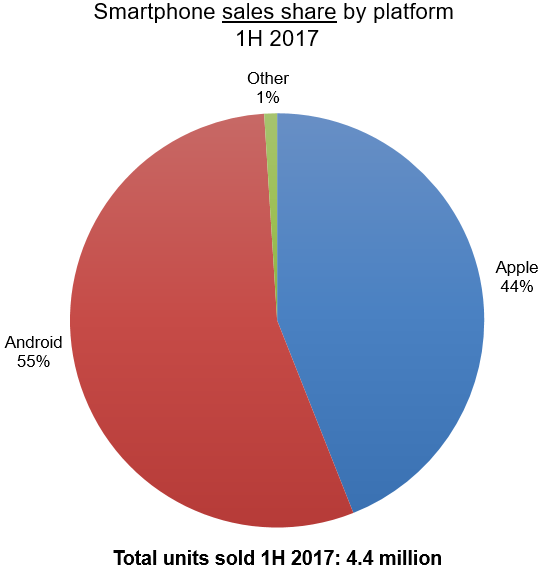 However, more Android models are expected to gain support in coming months, adding to the ongoing battle for smartphone supremacy. 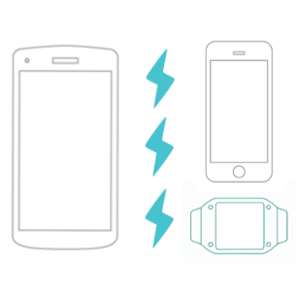 Telsyte measures smart wearable devices in the Telsyte Australian Smartphone & Wearable Devices Market Study 2017-2021 as computing accessories worn on a user’s wrist typically paired and controlled via a smartphone. Examples includes products from Adidas, Apple, Asus, Fitbit, Garmin, Huawei, Jawbone, LG, Microsoft, Motorola, Nike, Pebble, Samsung, Sony, TomTom and others. Interviews conducted with executives from service providers, network operators, manufacturers, retailers, financial analysts and channel partners. Financial reports released by service providers and manufacturers. Analyst reviews of leading smartphone and wearable devices. Telsyte measures sales of devices (“sell out”), not shipments or sales to retailers or carriers (sometimes called “sell-in”). Telsyte believes this is a more accurate measure of performance of products in a marketplace. Telsyte does not rely on disclosure from vendors or general assumptions made for large multinational companies that do not release local market data. Telsyte uses a comprehensive methodology that includes surveys of consumers, discussions with vendors, carriers and their partners, retailers, and financial analysts. In addition, public financial results from manufacturers and carriers are used. Telsyte tests a wide range of products in real life usage scenarios and conducts satisfaction and repeat purchase surveys with large and representative samples of Australian smart device users. Telsyte is a pioneer in measuring and reporting smartphone sales in Australia and has been providing insights on mobile technologies since 2006.